Hi! I'm Helen, welcome to my blog! My mum always sewed, knitted and made stuff, and I seem to have picked up the genes. As a child, I received a vintage Singer machine for my birthday one year, and I used to make dresses for my Sindy on it (2 squares of fabric, sewn at the top and the sides, and worn belted), as well as helping my mum with various projects, although I never really learnt to sew from patterns myself. When I moved to London aged 23, my mum gifted me her New Home machine (her 21st birthday present), which I used to take up skirts and jeans, and generally mess around. I still didn't know how to follow patterns properly, but I liked the idea of making things. 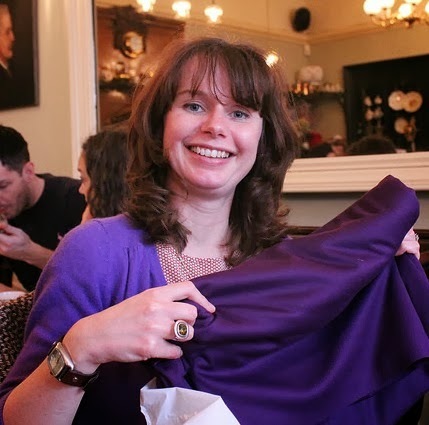 Six years later I moved to Edinburgh, met my now husband and decided to join a dressmaking evening class. I adored the class, but pretty soon discovered I was pregnant and so had to leave sewing for another year or so. In 2011, I signed up for another dressmaking class. 6 months later I discovered the online sewing community, and I haven't looked back. I would now describe myself as a fully committed sewing obsessive, who now has 3 sewing machines and an overlocker to her name. I still have a LOT to learn, but I am getting there, one garment at a time! Come and join me! You can drop me a line at: grosgraingreen@hotmail.com, and you can follow me on the following: Instagram, Twitter, Kollabora , Flickr and Pinterest.